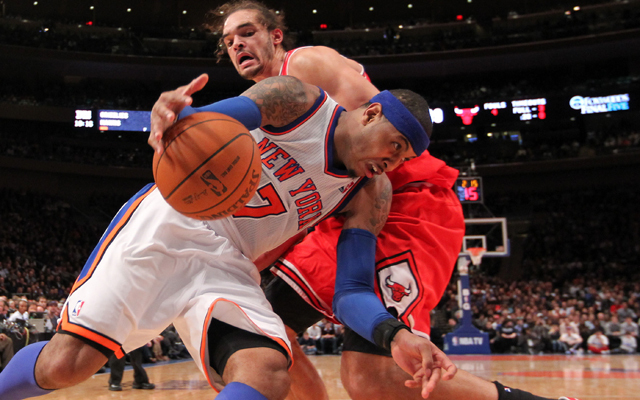 The Knicks (34-45) will host the Chicago Bulls (47-32) tonight at Madison Square Garden. Gametime is 7:30 PM. The Knicks were eliminated last night when the Hawks beat the Heat, so in many ways, this game is meaningless. Watch the Bulls tonight. Watch what a well-coached team with unselfish players can do, even when they have lost key players to trade or injury. Let’s hope the Knicks can become that kind of team: a team that does what it takes to win. They did it last year, and their failure to get gritty and do the little things this year caused this season to be a failure. It is unclear who will play today. For the Knicks, the usual starting lineup is Raymond Felton, JR Smith, Melo, Amar’e Stoudemire, and Tyson Chandler. But with the Knicks out of the playoff race and Melo battling a shoulder injury, Mike Woodson might sit his star instead of continuing his tradition of running Anthony into the ground for 45 minutes. Beating the Bulls tonight gives the Bulls a better chance of falling into 4th place and meeting the Nets in the first round. The Nets would much rather play the Raptors. So let’s win tonight, and try to screw over the Nets. We owe them one. This entry was posted in Articles and tagged Carmelo Anthony, carmelo bulls, carmelo knicks, KNICKS, KNICKS MEMES, knicks pregame, knicks pregame report, knicks vs bulls, Tommy Rothman, tommy rothman knicks on April 13, 2014 by Tommy Rothman.